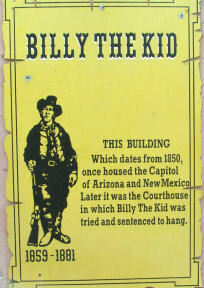 Billy the Kid Gift Shop is located in the old courthouse, one of the most historic buildings on the plaza. A trip through it is an absolute must. Take time to look at the old vigas and latillas. The vigas are the large wooden beams which support the roof. The latillas are the stripped branches which are layered between the vigas. This old adobe building has the original 18 inch walls made of mud bricks. If you will notice it is always cool in the summer and warm in the winter. This historical building was built early in Mesilla's history. 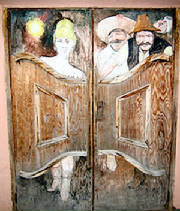 It is said to have housed the state capital when Mesilla was the capital of the Arizona Territory. Local tales also tell of men working out the details of the Gadsden Purchase in this old building. After the civil war, the county used the building as the county courthouse and jail until 1882. It was here that Billy the Kid was tried and sentenced to hang on April 13, 1881. He was taken back to the courthouse in Lincoln where he escaped. Later he met death at the hands of Pat Garrett. Some say the ghost of Billy the Kid still lives in this building. At one time this building held a courthouse, jail, and school at the same time. It is said that the children would be let out of school before a hanging so they would not see it. In 1905 the Florencio C. LOopez family bought the property and opened a bar and a billiard hall until 1913. Today it is owned by a local Mesilla family and operates as a gift store. Take some time to browse through the interesting gift shop which now resides in this building. Try to listen to the secrets of history which these walls contain. Open 11-5 Monday through Friday, Saturday 10-5 and 12-5 on Sunday. 2385 Calle Guadalupe, Box 531, Mesilla, N.M. 88046 505-523-5562, billythekid@mesilla.com.